Good contemporary realist art should tell us something more than photography can do. Paradoxically, there are several types of realism, such a photorealism, hyperrealism and surrealism. I am most keen on the later, because it allows room for the viewer's own dreams and imaginings to join those of the artist. 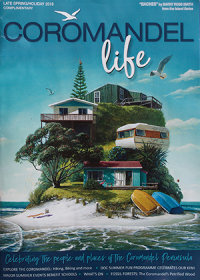 So, when I saw Barry Ross Smith's new paintings I got very excited. His past work depicting animals, people and objects has been highly competent, but somewhat too close to the photographic for my taste. Now his ability to paint anything has enabled him to produce a remarkable set of fantasy islands, impossible but totally convincing. The perspective is uncannily accurate. Some, like the one illustrated, are holiday havens. How we would love to step ashore from a dingy onto these scenic gems! Others are covered improbably with urban villas. Access to these is more difficult - one senses that uninvited guests may not be welcome. 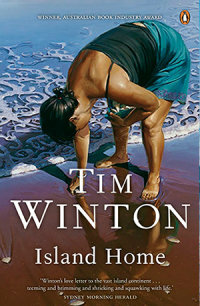 Penguin Random House Australia approached me with a request to use a few of my paintings for the second editions of Tim Winton’s 3 non fiction titles, The Boy Behind the Curtain, Island Home (pictured) and Land’s Edge. He writes: Tim came to me with your beautiful piece The Bach as a suggestion when I started out on the project. He loves your work, and I could see immediately how it resonates with his writing. I’m not sure how (or even if) familiar with Tim’s work you are, but much of it is based on the Western Australian coast (where Tim still lives), and The Bach seemed a wonderful fit. As I developed concepts for the other 2 books, it just seemed logical to try a set of concepts using your wonderful art, which, thoroughly unsurprisingly, everyone (by which I mean internally here at Penguin…publishing, sales, marketing, and more importantly, Tim) has fallen in love with. 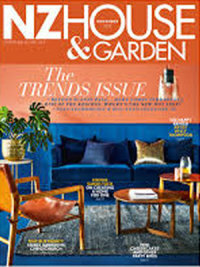 The archetypal New Zealand colonial house, with bay window and gabled front, has fascinated many painters. In the Village, Barry Ross Smith has created a surrealistic variation. All surrealism contains the sharpness of detail characteristic of a dream and here the isolation, the sunset and light in the door and window emphasise the dreamlike atmosphere. There is a hint of Belgian artist Magritte but this is a very local image. 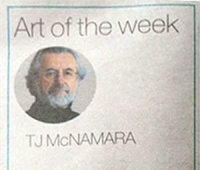 Art of the week, NZ Herald by T J McNamara. A selection of my work appeared in this magazine, the end of the 2015 year issue of Poets & Artists, curated by John Seed and Didi Melendez. There are some of my favourite contemporary painters, along with examples of their works. I was privileged to win the peoples' choice award for the 2014 Adam Portrait Awards and used the opportunity to fly down to Wellington with Leanne and spend the day together, without the kids.see the show. We had a great time tripping round Wellington, shopping and seeing the sights. The exhibition holds a very interesting collection of characters evoked in paint. 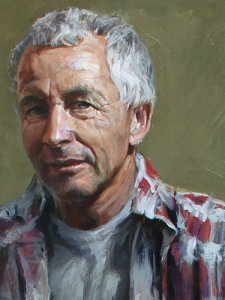 The Adam Portrait award was won this year by Henry Christian-Slane. I was privileged to win the peoples' choice award and used the opportunity to fly down to Wellington with Leanne and spend the day together and see the show. We had a great time tripping round Wellington, shopping and seeing the sights. The exhibition holds a very interesting collection of characters evoked in paint.